^ Gudmundsson, Magnus Tumi; Larsen, G; Hoskuldsson, A; Gylfason, A.G. (2008). 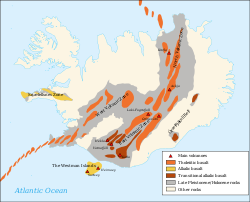 "Volcanic Hazards in Iceland". Jokull 58: 251-268. ^ Waugh, David (2002). Geography: An Integrated Approach. United Kingdom: Nelson Thornes. p.16 ISBN 978-0-17-444706-1. ^ Thordarson, Th; Hoskuldsson, A (2008). "Postglacial Volcanism in Iceland". Jokull 58: 197-228.